My fiance and I live in Detroit, and are totally owned by our Fluffy Corgi and sweet German Shepherd! I love city life. Nobody thinks Detroit is safe, but there are pockets of it that are fabulous and beautiful. I work as a graphic designer for a printing company, as well as freelance design and photography. And I LOVE CORGIS! Griff is a sable Fluffy, and after years of claiming him as Pembroke, I've decided he's actually a CARDIGAN! My question is can dogs get stomach bugs? Zelda, my German Shepherd, has been puking up her food for the past two days. She vomits everything up, followed by bile, followed by dry heaving. Yesterday she had surprise diarrhea on the balcony. I noticed her stool was slightly softer than usual when I cleaned it up at dog park on Tuesday evening as well. I have been seriously thinking about Griff's heritage lately! We adopted him from the Humane Society when he was 10 months old, so we don't have the exact story of his lineage. We were told that his Pembroke mother was rescued from a puppy mill while pregnant with Griff, but who the father was - who knows? Recently my man and I bought a projector for our living room in lieu of a TV. It's fabulous for watching movies and TV that streams online, but it has created an absolute monster in Griff. He has always had an obsession with laser pointers - he doesn't stop chasing it long after it has disappeared - but this is something new. A Must-See for All Corgi Lovers!! 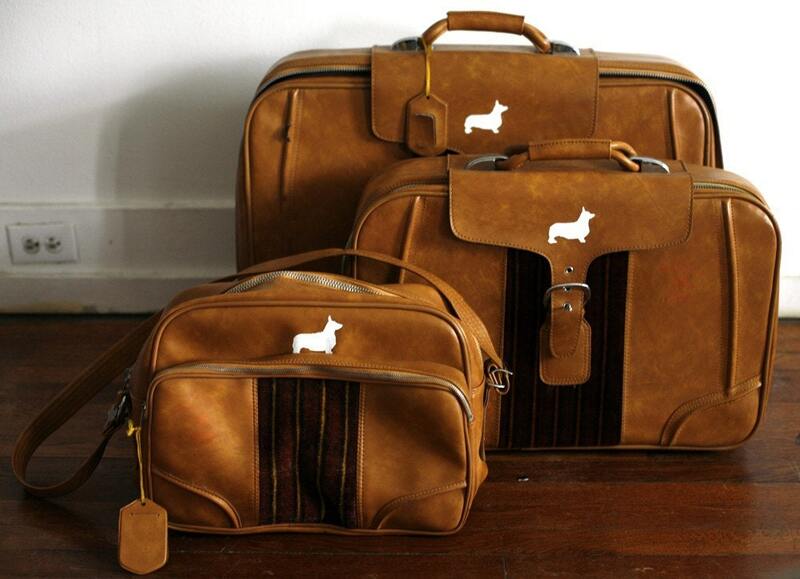 Found: Adorable Corgi luggage. LOVE IT SO MUCH! Hot Spots? Summer Sores? Need Help! your boy is so adoreable!!!! just came across that wonderful pic of your Griff and had to do a double-take. I have a corgi and a sheltie and as you mentioned above, I totally agree that Griff looks like a marvelous combo of both those great breeds!! Hi! Your Corgi's name is Griff?? How cool! Ours is named Gryff! :) Small world indeed. He's so cute!!! Yeah, by comparison, these guy are midgets. The mother of their litter was tiny though. I've never seen such a small Corgi. At one point Bear tipped the scales at 55#, and his sister almost 50. In the end I think that contributed to his health issues. He became diabetic in his last year and we had to give him insulin shots twice a day. No people food for these guys. Since they never get it, they don't really know what they're missing. Hopefully that will help keep them healthy and happy for 15 years or so. Griff is a good looking guy. I can't blame him for not wanting to stay out on Jan 16th. I remember that morning. It was -14 here and my Corgis would NOT come in. I had to go out and get them. I just saw the picture of your dog sleeping with his tongue out! Haha my Sparky does it all the time! He is so cute cause unless you tug on it gently he doesn't even realize that he has it out. haha too cute! Hello! i saw pics of your babies on your group. I was wondering if they are full-blood corgi? and what is the all white one?